As definitive withdrawal from Iraq inches ever nearer into our finger-crossed view, elliptical confrontation of military trauma is once again becoming fashionable in American cinema houses. And it’s all the better if the horrors are not necessarily our own, but instead offer a mechanism for vicarious coping with our blithely hegemonic behavior (such as the magma of repressed Palestinian culpability that erupts at the climax of Waltz with Bashir). Perhaps this explains why Andrzej Wajda’s Katyn—a Howard Zinn-esque history lesson viewed through weary subaltern eyes—was nominated for the foreign-language Oscar in 2008 but still remains widely unseen by U.S. audiences a full 12 months later. Purportedly undertaken to “proclaim” the details of the Katyn forest massacre (wherein the lives of over 20,000 Polish intelligentsia and upper echelon armed forces commanders, including the director’s father, were systematically terminated by Soviet soldiers at Stalin’s behest in 1940), the film trudges dazedly through the barbed no man’s land between historical reenactment, familial drama, and gritted-teeth polemic. Katyn derives its élan from agitprop logic, affixing the grisly slaughters as both denouement and grim, damning payoff. But they also form a structural black hole of anticipation that dwarfs and devours any hint of conventional plot mechanics. Regardless of whose stories we observe, we know that all roads lead back to the dark woods—an acknowledgement that anxiously renders the remainder of the material ineffectual by comparison. At the start we’re shown Polish soldiers being forcibly severed from both their wives (expectedly painful) and the opportunity to continue defending their country (surprisingly depicted as even more torturous; these men lust desperately after dignified combat). From there, however, we leap to the waning hours of WWII and focus haphazardly on the massacre’s emotional footprint, primarily through the excruciating existences of the abandoned widows. As teams of military hands daily excavate and ship home flashback-inducing mementos from an orchard of unmarked graves, we watch the continuing Soviet occupiers superciliously deflect their responsibility in the killings on to the more easily indicted Germans. The Polish populous has no choice but to grudgingly acknowledge the revisionism, mostly by signing pre-composed statements virtually at gunpoint. In the midst of this, the private lives of the post-war generation are nervously limned with a nearly sexual tension; the narrative flits from character to character, seemingly driven to fevered distraction by a century of disallowed grief. The lack of focus arrives at an appropriately diverse portrait of national-scale, if clandestine, venting; for example, some wives staunchly refuse to exonerate the Soviets in closed-door negotiations, and victims’ progeny coming of age in Katyn’s shadow recalcitrantly reference the affair on their university documents. 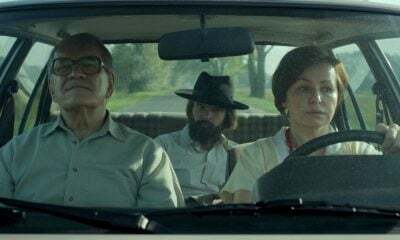 But it also denies its audience the convenience of a protagonist who might more identifiably embody the glacial struggle for historical accuracy and, more obliquely, a solidarious post-occupational Polish identity. 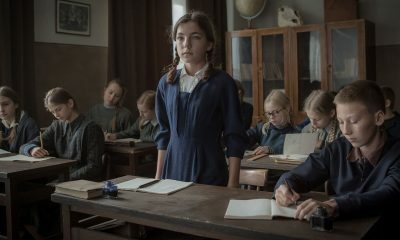 Anna, the wife of a captain who is understood as a partial appropriation of Wajda’s father, nearly approaches the status of focal point; her experience both initiates the narrative and furnishes an entry point directly into the murderous finale (via the discovery of her husband’s diary). But each time the plot forks from her trajectory we feel a loss of intimacy with the material, so much so that when it becomes clear that we’ll see the Katyn massacre through the captain’s scribblings it borders on contrivance rather than seeming like an earned objective correlative for the story to conveniently uncover in Act Three. But bemoaning the absence of a conventional plotline and cast hierarchy that would make Katyn more internationally accessible also fails to grasp the significance of the film as an incisive social transaction. Unlike, for example, the burden of Nazi-German legacy that the makers of the abysmal The Reader unrightfully heaved onto their British-American shoulders, Wajda means not to tease out the dramatic potential in these events but to confront a cumbersome heirloom of an onus with contemptuous veracity. Unlike the thrilling, noir-driven patriotism of Ashes and Diamonds (and the universally iconoclastic appeal of its charismatic star), the handheld camera of Katyn‘s explosive final moments wincingly collapses the distance between spectator and crime: Audience members are induced into an unsettling gut reaction reconfiguring themselves as either sadistic perpetrators or helpless victims. It’s enough to make an American pensive with contrition, not only as he realizes his ancestors’ compliance with the Katyn cover-up but also as he queasily considers what deservedly accusatory art pieces may surface from the now-emancipated Guantánamo Bay sufferers (among others) in the decades to come.